Search engine page results are certainly changing with time… not necessarily a good thing for organic SEO. Now looking at today’s results for Canada Election 2015. 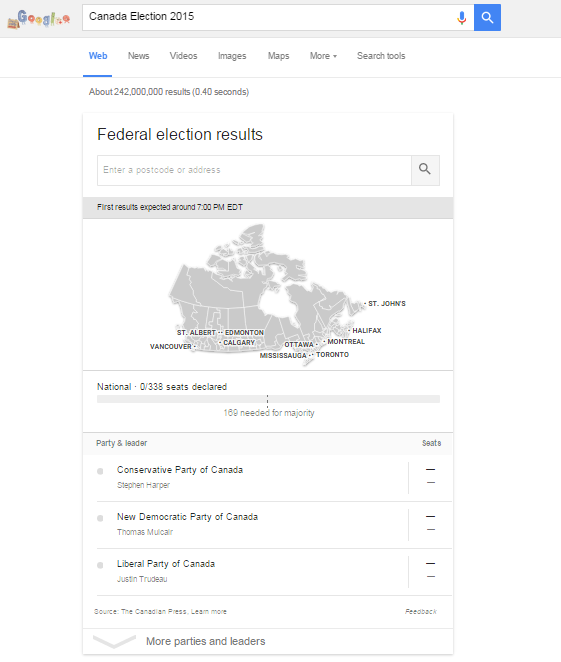 As I wanted to read few couple articles, I typed the keyword “Canada Election 2015” and the results were as you can see capture below. The top articles from news sites were way down… now Google featured election snippet took most of the screen. Good for users? Unsure, maybe little unfair for publishers. I can see an expandable snippet useful to users but taking a full page and pushing organic results in such a big event where so much content are created by 100’s of sites is a big push. We’d love to hear your feedback!